The state of the climate is represented visually with this dress designed by Danish design company, Diffus. The “Climate Dress” is a high-tech experience that senses the CO2 concentration is the air, triggering a diverse light pattern. 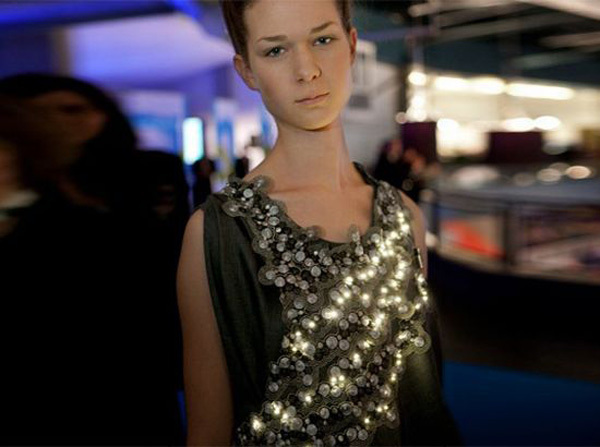 Hundreds of tiny LED’s are hand-stitched within the embroidery of the dress and are then inserted into a CO2 sensor and Lily pad microprocessor. 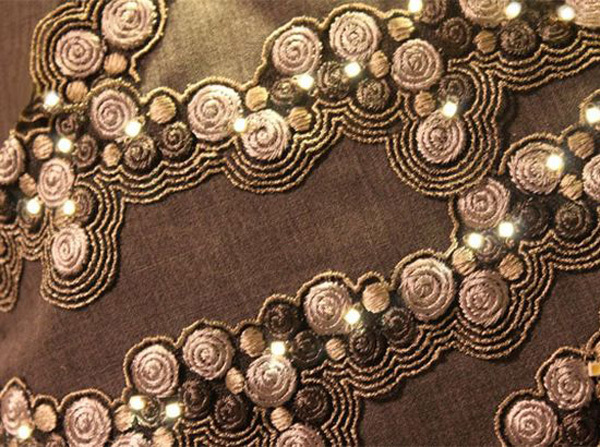 The LEDs visualize the level of CO2 in the nearby surroundings and are powered trough the embroidery. A soft conductive thread was used that made the embroidery possible and the look very esthetical. As CO2 is sensed, the LED’s react accordingly, creating diverse light patterns varying from slow, regular light pulsations to short and hectic. This working model achieved one of Diffus’ goals: To support the interaction between human and computer technology in a non-screen-based environment – an environment with physical and sensual qualities appealing to our human intuition and adapted to our daily life. The advancement of this technology, in the future, can help to inform and educate us on the health of our surroundings. The integration within textiles offers a surface that can be integrated into a host of environmental solutions.